As part of an organization doing leading research for more than 30 years, our team has published extensively on population health, women’s health and health behavior change. We strive to disseminate our findings as broadly and accessibly as possible so others can benefit. Learn more about our research and outcomes by exploring our archives below. Socio-economic factors are creating a higher burden of chronic illness, and therefore a lower life expectancy, for the 46 million Americans living in rural America. In fact, research shows rural Americans are more likely to die from heart disease, cancer and the three other leading causes of death than their urban counterparts. For those who care about the future of rural America, the challenge that lies ahead for rural health care systems is clear. To successfully transform from simply surviving to thriving, we must start with the Triple Aim, and examine how we define success, not only in our health care system, but also in the overall health status of our communities. This begins with a vision, and for rural population health, that vision is to realize the full health potential of our communities by leading and innovating in access, value and health improvements as proven by our outcomes. To successfully achieve this vision requires a multi-layered strategy. Leadership and innovation in access, value, health improvements, outcomes monitoring and data analytics are all critical ingredients for success in achieving the Triple Aim of improving the care experience (quality and access), increasing value and affordability, and improving population health outcomes. 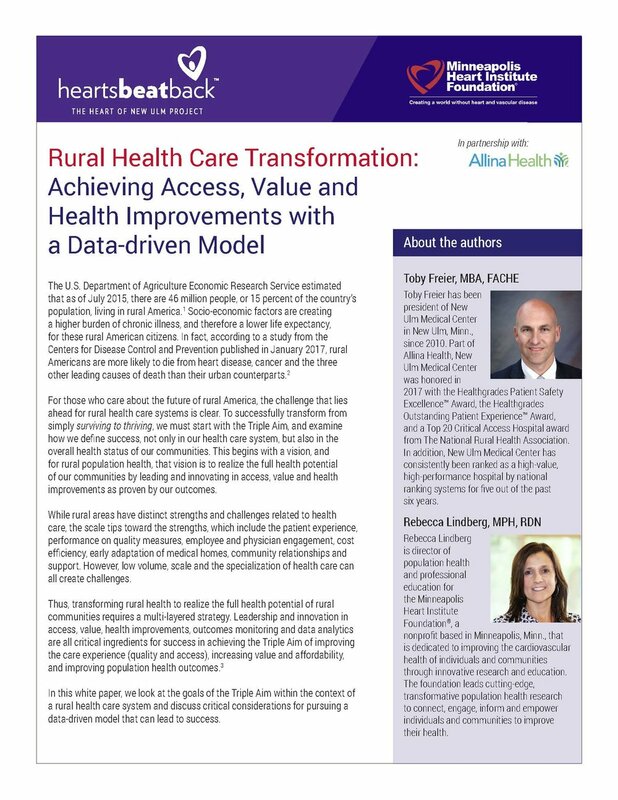 Our white paper examines the goals of the Triple Aim within the context of a rural health care system and discusses critical considerations for pursuing a data-driven model that can lead to success. 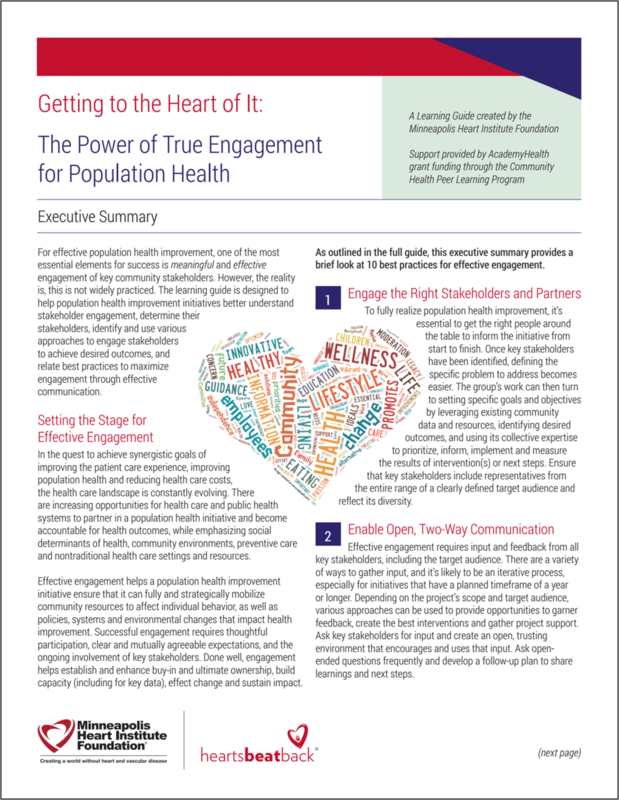 A learning guide, “The Power of True Engagement for Population Health,” was published by the Minneapolis Heart Institute Foundation’s® (MHIF) population health team in conjunction with AcademyHealth. The population health team, which manages MHIF’s award-winning, 10-year population health research project called Hearts Beat Back: The Heart of New Ulm Project in New Ulm, Minn., participated as one of five subject matter expert communities in AcademyHealth’s 2016-17 Community Health Peer Learning Program. The learning guide provides population health initiatives with guidance on how to foster stakeholder engagement in key activities and achieve broader mission buy-in among community partners and observers. The guide includes numerous case study examples from The Heart of New Ulm Project. The complete learning guide, an executive summary and a communications strategy primer are available in the sidebar. A video summary is also available below. More information on how health care leaders can partner with MHIF to improve population health in their communities is available here.